1) Right now this map is very sparse. Most of the shark-kin "settlements" should be near the southern shore. 2) The area between Mare Crisium and Vedal is highly contended and there should be several ruins along those borders. Thanks to: Thorfinn Tait, for providing some wonderful graphics to use in all of our mapping projects, Sharon Dornhoff for developing the setting. 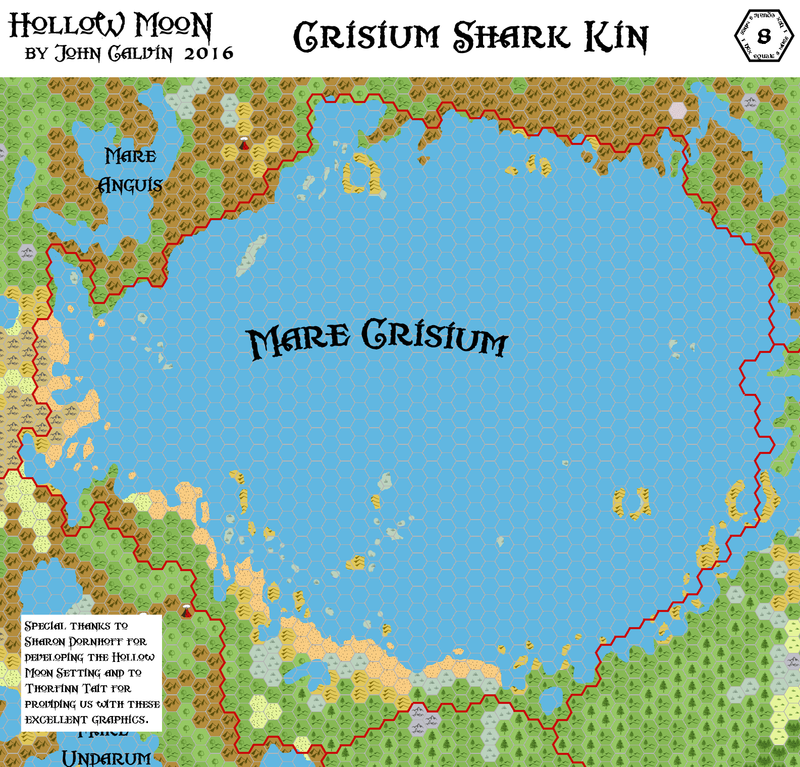 1) Out beyond Tranquillitatis, south of the Wallaran dreamscapes and the arid steppes of Sohktar, the shark-kin of Mare Crisium's shorelines prosper on the land, even as their fellows do, beneath the distant Mare Humorum's waters. After the fall of Adhuza in the Sea of Dread, the shark-kin began their long and arduous journey back to freedom. Used as shock troops in the kopru’s empire, it was not easy for them to eek out an existence without the support of their former masters, nor for them to gain the trust of their Undersea neighbors. When Taymora sank beneath the waves, the shark-kin of the Sea of Dread finally had the means to thrive again. All of the small islands that dotted the Sunlit Sea made perfect spawning grounds for their young, and once again their numbers thrived. This golden era of the shark-kin was not to last however. When the Ierendi and Minrothad islands became bastions for the land dwellers, shark-kin were pushed back into the sea. As sailing ships started to once again ply the waves, conflicts between the shark-kin and the air breathers intensified. It was inevitable that the scaly, semi-amphibious shark-kin, who relied on pristine uninhabited sandy shores to spawn their young, would soon lose this battle. The burgeoning Thyatian Empire put the last nail in their watery coffin. With bounties placed on their toothy maws, the shark-kin of the Sunlit Sea were hunted to near extinction. With few land dwelling civilizations near the shores of Mare Crisium when the shark-kin arrived, they quickly rose to prominence in the region. The north and south-eastern shores of Mare Crisium, lined with black volcanic sand, made perfect spawning grounds, as did the numerous small offshore islands. The shark-kin’s closest neighbors, the Cacklogallinians in the southwest, had little desire to ply the waters of Crisium, and since the Mare is isolated from the other oceans of Matera, ships from other seafaring nations would never sail its waters. The shark-kin of Mare Crisium had finally found a home. Relations with the gyerians of Cacklogallinia were lukewarm at first, but quickly solidified thanks to the bird men’s mercantile skills. They traded with the shark-kin tools and materials that could not be found or created in their watery environment, and in return received all the bounty of goods that the waters of Crisium had to offer. When the humans of Vedal began to explore their world, interactions with the shark-kin were more tense. Not having forgotten their treatment by humans of the Outer World, the Crisium shark-kin were quick to defend their borders. Since then aggression between the two cultures has cooled, though the shark-kin will still not tolerate any vessel to sail their waters. The shark-kin of Crisium are just as comfortable on the shores of their territory as they are beneath the waves, and communities have grown up on both sides of the water. Those dwelling in the sea live a fairly nomadic existence, following the schools of fish that they hunt for food, while shark-kin living on the surface have fairly sedentary lives, trading with their kin beneath the waves and strangers from further inland. Individual shark-kin are not constrained to either type of existence, and in fact many shift between the sea and the shore several times within their lifetimes. Communities built on the shores of Mare Crisium are generally devoted to trade, and the shark-kin will tolerate the company of most outsiders who behave themselves while in their territory. Island beaches in the Mare itself are generally considered to be off limits to outsiders, many of them being spawning grounds marked with totems sacred to the shark-kin. Most shark-kin tribes are independent from one another, each having their own chieftain and head priestess to lead them. The tribes have been known to unite under a single king sporadically throughout the ages, often in times of duress or when outside forces threaten their way of life. Such dynasties typically never outlive their founders, with the tribes reasserting their own dominance once the king dies. Two major volcanoes border the northeastern and southeastern shores of Crisium. The northern crater erupts once every 10 years, spewing smoke into the sky and peppering the nearby land and sea with burning rocks. While the outburst can be deadly, it is over quickly and easily avoided, and most locals have no problems navigating its dangers. The southern volcano belches forth fumes and smoke on a yearly basis, but every 70 years it erupts violently, often clearing the nearby shores of all traces of civilization. Though the shark-kin can avoid its wrath by escaping into the sea, these times are especially dangerous for the creatures, as on several occasions, forces from Vedal have attempted to claim territory along the southern coast after such eruptions. The Fire Times have come and the shark-kin settlements on the southern shores of Crisium have been decimated. Shark-kin returning to reclaim their homes are met by bands of Vedal war parties squatting on their lands. Abinesh, the Vedali war leader is one of the chambahara seeking “exotic fare” that he can add to his dinner table. Kakkrr, an outcast of his people has stolen his tribe’s sacred totem and fled to the waters of Mare Fecunditatis. Without their totem, the tribe’s spawning grounds will be cursed. The PCs must help a band of shark-kin traverse the territory between the two Mares, and track down the outcast and his nefarious band. A powerful chieftain has been uniting several shark-kin tribes under his banner around the northeastern coasts of Mare Crisium. As the tribes move westward they sing the praises of King Zllazk “Shred Tooth”, and slaughter any tribes that oppose his rule. Unknown to all, a lone kopru has somehow managed to find a foothold in the Sea and is attempting to consolidate a foothold for Adhuza using King “Shred Tooth” as his puppet. Should he succeed, Vedal, Cacklogallinia, and the Trade Cities will all suffer from his depredations.